Not to be confused with Lassana Diarra (Malian footballer). Lassana Diarra (born 10 March 1985) is a French retired professional footballer. His predominant position was as a defensive midfielder but he could also play in a more advanced role and has played at right back, which he occasionally has done for the France national football team. Diarra has, in his club footballing career, featured for Chelsea, Arsenal, Portsmouth, Real Madrid and most recently Paris Saint-Germain before being released on 21 February 2019. The Frenchman has also played for Russian clubs Anzhi Makhachkala and Lokomotiv Moscow. Diarra was turned down by football clubs as a youngster; Nantes deemed him too "small and lightweight" to succeed at 170 cm and 58 kg (5'7" and 9 stone). He admitted he thought his "football career was over." His next stop was Le Mans UC, where Diarra claimed they "didn't seem to care" about him. Diarra's footballing career finally began at Le Havre, a former French top-flight football team. Outstanding in his defensive midfield role, his reputation started to grow and impressive performances saw his selection to the French under-21 squad. Along with the reputation came interest from other clubs, and Chelsea became potential suitors. With Chelsea's Claude Makelele getting older, Chelsea's scouts tagged Diarra as the "new Makelele". Diarra was spotted by Gwyn Williams playing for France in the 2005 Toulon Tournament and initially came on trial, before the club paid £1 million for his services in July 2005. Diarra during his time at Chelsea. Diarra was in Chelsea's first team squad in the 2005–06 season, but did not see much first-team football. His Chelsea debut came in the UEFA Champions League in October 2005, when he was given a brief run out as a substitute when Chelsea were 4–0 up against Real Betis. Learning from Claude Makelele he played well against Huddersfield Town in the FA Cup third round, winning rave reviews from both managers, teammates, and media sources. He made his league debut when he came on as a substitute for Makelele on 5 February 2006 in a 2–0 win over Liverpool. He became a bit part player in Chelsea's first team and also completed the full 90 minutes in Chelsea's last two games of the season at Blackburn Rovers and Newcastle United respectively, as manager José Mourinho rotated his squad. This meant Diarra ended the season with three league appearances as Chelsea won the 2005–06 FA Premier League. Diarra was named Chelsea's Young Player of the Season for 2005–06. Due to Chelsea's defensive injury setbacks during the 2006–07 season, he was often asked to play at right back. He played full Premier League games against Blackburn, Charlton Athletic and Middlesbrough, with some success. He also started in Chelsea's win over Arsenal in the League Cup Final at the Millennium Stadium. He was an unused substitute as Chelsea won the 2007 FA Cup Final against Manchester United. On 29 July, reports surfaced suggesting he could be on his way to Arsenal in pursuit of first-team football. Despite this, he came on as a substitute for Chelsea in the 2007 FA Community Shield. His contract with Chelsea was due to expire in January 2008, and having made no move to extend it, Chelsea sold him to Arsenal on 31 August 2007, before he could leave on a free transfer. Diarra training during his time at Arsenal. On 31 August 2007, transfer deadline day, he signed for Arsenal for an undisclosed fee. He was given the number 8 shirt, vacated by the departure of winger Freddie Ljungberg. On his move across London, he cited Gunners manager Arsène Wenger as one of the main reasons for joining the club, along with the style of football played by Arsenal. Wenger had called the young Frenchman a "multi-functional player", and a good addition to the squad. Diarra made his Arsenal debut as a late substitute in the home leg of the 2007–08 Champions League group stage match against Sevilla, and his full debut against Newcastle United in the third round of the League Cup. He then started his first Premier League match for Arsenal against Wigan Athletic on 24 November 2007. With the emergence of defensive midfielder Mathieu Flamini in the Arsenal side, Diarra saw only limited action in the early months of the season. Having expressed concerns that he was not playing enough first team football, Diarra signed for Portsmouth in January 2008 after only five months at Arsenal for an undisclosed fee believed to be around £5.5 million. Diarra signed for Portsmouth on 17 January 2008. He was given his first start against Derby County, contributing to a 3–1 win at Fratton Park. He scored his first goal for the club in the following match, against FA Cup Fourth Round Championship opponents Plymouth Argyle, and his first Premier League goal two weeks later, a controversial late winner against Bolton Wanderers. Diarra went on to play in every minute of Portsmouth's remaining FA Cup matches en route to claiming the trophy in the final. He topped the season by being included in the France squad for UEFA Euro 2008; this and the FA Cup win arguably vindicated his decision to part company with Arsenal, Diarra himself saying that it had "more than justified my decision." He played in the 2008 Community Shield against Manchester United, missing in the penalty shootout, which was won by United. On 18 September 2008, he scored Pompey's first-ever goal in a major European competition against Vitória de Guimarães, his third and final goal for the club. The first red card of Diarra's Premier League career came on 28 September 2008 when he was booked twice against Tottenham Hotspur at Fratton Park. On 17 December 2008, Portsmouth agreed a fee with Real Madrid for the transfer of Diarra on 1 January 2009 for a fee of around €20 million (£18.88 million), subject to a medical. He was assigned the number 6 shirt of Mahamadou Diarra for domestic competitions, as the Malian midfielder was out with a season-ending injury and the vacant number 39 for the Champions League. He wore the name "Lass" on the back of his shirt to avoid confusion with Mahamadou. Lassana Diarra's transfer was officially completed on 1 January 2009, the opening of the transfer window. Madrid had planned to add both Diarra and fellow new signing Klaas-Jan Huntelaar to their 2008–09 Champions League squad, but both players had already featured in the same season's UEFA Cup for previous clubs Portsmouth and Ajax respectively; UEFA rules would allow only one of the pair to be registered by 1 February 2009, and eventually Diarra was selected to play in the competition. Diarra's performance for Real Madrid in his first few months earned him a spot among the starting eleven on UEFA's 2008–09 La Liga Breakthrough Team. The Madridista joined Sevilla's Diego Perotti as the only foreigner on the list. According to the UEFA website, he "joined Real Madrid in the winter transfer window with a very low profile, although in a few short months he managed to convince the demanding Madridista fan base." For the 2009–10 season he was assigned the number 10 shirt after Wesley Sneijder moved to Internazionale and Mahamadou Diarra came back from injury and reclaimed the number 6 shirt. Lassana Diarra scored his first official goal for Madrid in the 2009–10 La Liga opener against Deportivo de La Coruña, providing his side with their winning goal in a 3–2 victory. In August 2010, it was reported that Diarra had been transfer listed by Madrid. However, manager José Mourinho included Diarra in his starting lineup for the first game of the 2010–11 La Liga season. Because Madrid bought Sami Khedira, Diarra faced further competition to get into the squad. However, Mourinho said he would not be leaving and said that he saw Diarra as a starter. Diarra in 2012 alongside Mesut Özil and Ángel Di María. After speculation of Diarra leaving Real Madrid during the summer 2011 transfer window, during which he did not participate in the team's pre-season, Diarra finally stayed at the club, wearing the number 24 jersey after Sami Khedira had taken number 6 and Mesut Özil number 10 during the summer. Diarra had a decent 2011–12 season, culminating in winning the La Liga title with the club. He participated in the team's 2012 pre-season, and won the 2012 Supercopa with the club. It seems he was forced out of the club alongside fellow midfield enforcer Esteban Granero to accommodate the stay of Kaká, despite the latter being linked with an exit. After falling down in the pecking order, Diarra was linked to join Russian side Spartak Moscow. On transfer deadline day, 31 August 2012, Diarra joined Anzhi Makhachkala on a four-year deal for an undisclosed fee. He was originally meant to join merely on loan, but the club decided to make the deal permanent. After joining Anzhi, Diarra made an explanation that he joined the club, claiming that Samuel Eto'o persuaded him to join and insisted money was not the reason he joined. After Anzhi made their whole squad available for transfer due to cost-cutting, there was talk of a number of clubs interested in Diarra's services; Monaco and Paris Saint-Germain were thought to be interested in taking him back to France. However, he eventually signed a four-year contract with Lokomotiv Moscow on 20 August 2013, taking the number 85 shirt. He became the second most expensive transfer in Lokomotiv's history behind only Mbark Boussoufa, who was signed by the club from	Anzhi Makhachkala in the summer of 2013 for €15m. Despite being sent off twice in his first matches for his new club against Zenit Saint Petersburg and Tom Tomsk respectively, Diarra quickly established himself in starting eleven, claiming one of two usual holding midfielder's posts alongside Dmitri Tarasov. In his first months at Lokomotiv, Diarra provided so many solid performances that someone even claimed that he was the strongest player in the history of the Russian Premier League. His growing influence in the team became acknowledged: in November and December 2013, he topped the monthly poll among Lokomotiv fans in social networks and received the Player of the Month award twice in a row. After the winter break, Diarra played only five out of eleven matches and his performances were a lot below the usual level. Things turned sour for Diarra at Lokomotiv in the summer of 2014, when he fell out with head coach Leonid Kuchuk. Matters came to a head when the club wanted to reduce Diarra's salary but he refused and even refused to turn up for training. 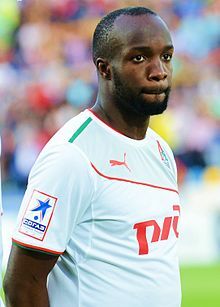 Lokomotiv dismissed Diarra in August 2014 on the grounds of his refusal to show up for training, with his contract set to expire only in 2017. It even sought damages from Diarra for breach of contract and managed to get FIFA to ban him from playing professionally for another club as long as his contractual dispute with it was not settled. Kuchuk was eventually sacked by the club in September 2014. After Diarra left the club, there were several months of speculation linking Diarra with signing for one of several, major European football clubs, notably Celtic, Inter Milan, Newcastle United, Queens Park Rangers and West Ham United. On 28 May 2016, Diarra was ordered to pay a 10 million euro fine to Lokomotiv Moscow for breach of contract by the Court of Arbitration for Sport (CAS), along with €110,000 to the CAS. He was also slapped with a 15-month suspension from playing professional football and suspension of payment of salary, both of which he had already served. On 24 July 2015, Diarra signed for French Ligue 1 side Marseille. After he left Lokomotiv Moscow in August 2014, FIFA banned him from playing professionally for another club pending the settlement of his contractual dispute with Lokomotiv. Diarra made his debut for Marseille on 23 August and scored his first goal in a 6–0 victory over Troyes, while also achieving a 100 percent pass completion. At the end of the 2015–16 season, Diarra was named in the Ligue 1 Team of the Season by the UNFP. On 11 August 2016, Diarra was named as the club's new captain, replacing Steve Mandanda who had earlier joined Crystal Palace. Following Rudi Garcia's appointment as new Marseille manager in October, however, Diarra's commitment to the club was questioned and he was later stripped of his captaincy in favour of loanee, Bafétimbi Gomis. Having made only 11 league appearances for the season, Diarra was released by Marseille on 14 February 2017. Former manager José Anigo later claimed that the breakdown of relationship between club and player stemmed from then-chairman Vincent Labrune's failure to honour contractual promises to Diarra. On 19 April 2017, Diarra joined Emirati club Al Jazira. He made five appearances in the UAE Pro-League before mutually terminating his contract with the club on 24 December 2017. On 23 January 2018, Diarra joined Paris Saint-Germain on a one-and-a-half year contract. The France international has become the 436th player to represent the capital club. He made his debut for the club under coach Unai Emery on 30 January 2018 in the 3-2 Coupe de la Ligue semi-final win against Stade Rennais F.C. On 21 February 2019, Diarra and PSG mutually terminated his contract with the club. He subsequently announced his retirement from professional football. Diarra won 18 caps for the France under-21s. Perhaps his most notable performance came in the 2006 UEFA European Under-21 Championship qualification play-offs second-leg match against England at the Stade Marcel Picot in November 2005. With the match several minutes from full-time and seemingly destined for extra time (the aggregate score was 2–2), he received the ball in the England penalty box, where a challenge from Kieran Richardson brought Diarra down. A penalty was given for the foul, and Diarra's teammate Jimmy Briand scored the penalty, shooting the ball past Scott Carson. France won the tie 3-2 on aggregate and thus qualified for the finals to be held in Portugal. Diarra was selected for the senior team by coach Raymond Domenech for a UEFA Euro 2008 qualifier away to Lithuania on 24 March 2007. He started the match, alongside Claude Makelele and Jérémy Toulalan in midfield, and played the full 90 minutes. He was also selected that year for a friendly match against Austria on 28 March 2007. Diarra's consistent club performances in 2008 resulted in him being picked for the France squad for Euro 2008, ahead of high-calibre players such as Djibril Cissé and Mathieu Flamini. France was eliminated in the group stage of Euro 2008 and Diarra did not feature in any of his country's three group stage matches. Following the international retirement of fellow defensive midfielder Claude Makelele, Diarra was called up for Domenech's France squad in the 20 August 2008 friendly with Sweden. By the end of the 2010 World Cup qualifying campaign, Diarra had made 26 appearances for France. On 11 May 2010, Diarra was named to the preliminary squad of Domenech's squad to play in the 2010 FIFA World Cup. He was later named to the shortened list of players and was expected to be a starter alongside Jérémy Toulalan in the midfield. On 22 May, however, while training with the national team in the high-altitude commune of Tignes, it was announced that Diarra was dropping out of the squad due to his suffering severe intestinal pain and stomach cramps as a result of the altitude. A follow-up medical check revealed that Diarra would require rest for an indefinite period. His club, Real Madrid, later revealed that Diarra was resting at home following medical advice due to asthenic syndrome secondary to sickle-cell anemia, a genetic blood disorder characterized by red blood cells that assume an abnormal, rigid, sickle shape. After an absence of over five years, Diarra received a surprise recall to the French team following a fine run of form at the beginning of the 2015–16 season. Upon announcing his return to the squad, France manager Didier Deschamps highlighted Diarra's performances in a struggling Marseille side as the reason behind his inclusion. On 12 May 2016, Diarra was named in the France squad for UEFA Euro 2016. On 30 May 2016, he played the first half of the friendly match against Cameroon and was replaced at half-time by N'Golo Kanté. However, Diarra later was forced to pull out of the squad because of a swelling in his left knee. He was replaced by Manchester United's Morgan Schneiderlin. Despite being an aggressive, hard-tackling and hard-working player, Diarra has unusually good ball control for a defensive midfielder, and has been praised for his physical strength in defence, as well as his composure, and strong mentality. Although he is usually deployed in the centre of midfield as a ball-winner, due to his energy, tenacity, and tackling abilities, he is also a creative player who can dictate the tempo of his team's play with his tidy and intelligent passing from deep midfield positions after winning back possession; he is also capable of being an offensive threat due to his ability to get forward and score goals, courtesy of his striking ability from distance. Due to his many attributes and versatility, Madrid's La Sexta television commentators refer to him as a "todocampista," or "jack of all trades", and he has also occasionally played in more advanced midfield roles, or as a right back. Diarra is a practising Muslim. On 13 November 2015, his cousin Asta Diakité was killed during a series of coordinated terrorist attacks in Paris. At the time, Diarra was playing for France in an international friendly against Germany at the Stade de France, just north of Paris in Saint-Denis. Diarra grew up supporting Marseille. ^ Hugman, Barry J., ed. (2009). The PFA Footballers' Who's Who 2009–10. Mainstream Publishing. p. 118. ISBN 978-1-84596-474-0. ^ "Official profile". Real Madrid. Archived from the original on 12 March 2010. Retrieved 4 February 2014. ^ a b c C. Colino. "Xabi saca el balón y yo hago más la guerra" (in Spanish). Diario AS. Retrieved 4 February 2014. ^ a b "Lassana Diarra: Talentspotter". FourFourTwo. 1 February 2006. Retrieved 16 June 2017. ^ "Chelsea 2-0 Liverpool". BBC. 5 February 2006. Retrieved 27 October 2015. ^ a b c d "Arsenal sign Lassana Diarra from Chelsea". Arsenal.com. 31 August 2007. Archived from the original on 3 November 2014. Retrieved 3 November 2014. ^ "Gunners line up Diarra deal | Football News". Sky Sports. Retrieved 2016-07-21. ^ "L'Equipe – Arsenal piste Lassana Diarra". L'Équipe. France. 31 July 2007. Retrieved 4 February 2014. ^ "Arsenal sign Lassana Diarra from Chelsea". Arsenal.com. 31 August 2007. Archived from the original on 22 February 2014. Retrieved 5 February 2014. ^ "Arsenal 2-0 Wigan". BBC. 24 November 2007. Retrieved 27 October 2015. ^ Caroe, Charlie (6 December 2007). "Lassana Diarra: I want to leave Arsenal". London: Telegraph. Retrieved 5 February 2014. ^ "French midfielder leaves Arsenal for the south coast". Arsenal.com. 17 January 2008. Archived from the original on 18 January 2008. Retrieved 17 January 2008. ^ "Diarra agrees Pompey deal". Sky Sports. 17 January 2008. Retrieved 5 February 2014. ^ "Backtracking Diarra commits to Portsmouth". The Times. UK. 18 January 2008. Retrieved 9 June 2008. ^ Whyatt, Chris (19 January 2008). "Portsmouth 3–1 Derby Match Report". BBC. Retrieved 9 June 2008. ^ Holt, Sarah (26 January 2008). "Portsmouth 2–1 Plymouth Match Report". BBC. Retrieved 9 June 2008. ^ Lillywhite, Jamie (9 February 2008). "Bolton 0–1 Portsmouth Match Report". BBC. Retrieved 9 June 2008. ^ Lewis, Aimee (17 February 2008). "Preston 0–1 Portsmouth Match Report". BBC. Retrieved 9 June 2008. ^ McNulty, Phil (8 March 2008). "Man Utd 0–1 Portsmouth Match Report". BBC. Retrieved 9 June 2008. ^ McKenzie, Andrew (5 April 2008). "West Brom 0–1 Portsmouth Match Report". BBC. Retrieved 9 June 2008. ^ a b McNulty, Phil (17 May 2008). "Portsmouth 1–0 Cardiff Match Report". BBC. Retrieved 9 June 2008. ^ a b "France leave out Cisse & Flamini". BBC. 28 May 2008. Retrieved 9 June 2008. ^ Hughes, Ian (18 September 2008). "Portsmouth 2–0 Guimaraes Match Report". BBC. Retrieved 16 April 2010. ^ "Portsmouth 2-0 Tottenham". BBC. 28 September 2008. ^ "Real Madrid unveil new boy Diarra". BBC. 22 December 2008. Retrieved 4 January 2018. ^ "UEFA decision on Real Madrid". UEFA.com. 8 January 2009. Archived from the original on 13 January 2016. Retrieved 4 January 2011. ^ "UEFA appeals body decision on Real Madrid". UEFA.com. 13 January 2009. Archived from the original on 13 January 2016. Retrieved 4 January 2011. ^ "Definitive Champions League list". Realmadrid.com. 2 February 2009. Archived from the original on 6 February 2009. Retrieved 2 February 2009. ^ Jones, Simon; Lawton, Matt (20 August 2010). "Exclusive: Tottenham go for star trio William Gallas, Lassana Diarra and Steven Pienaar". Daily Mail. London. Retrieved 21 August 2010. ^ "Real Madrid C.F. – Official Web Site – The Whites draw in league debut despite having several chances on goal". Realmadrid.com. 29 August 2010. Archived from the original on 3 September 2010. Retrieved 28 April 2011. ^ "Football , La Liga , Mourinho: United can forget Diarra". Espnstar.Com. 8 January 2011. Archived from the original on 7 September 2012. Retrieved 28 April 2011. ^ "Real Madrid's Lassana Diarra left out of pre-season tour of the United States - report". Goal.com. Retrieved 2016-07-21. ^ "Lass Diarra has Spartak offer – agent". ESPN Soccernet. 25 June 2012. Retrieved 11 September 2012. ^ "Official: Lassana Diarra joins Anzhi on four-year deal". Goal.com. 3 September 2012. Retrieved 11 September 2012. ^ "Anzhi signs Lassana Diarra on loan from Real Madrid". Goal.com. 1 September 2012. Retrieved 11 September 2012. ^ "Diarra: I joined Anzhi because of Eto'o, not the money". Goal.com. 11 September 2012. Retrieved 11 September 2012. ^ "The Never Ending Story About Lokomotiv and Lassana Diarra". Russian Football News. 31 May 2016. ^ Jones, Simon (23 August 2014). "Lassana Diarra set to sign for QPR following his sacking from Lokomotiv Moscow for refusing to train after falling out with coach". Mail Online. Retrieved 3 November 2014. ^ "Interdit de jouer au foot, Lassana Diarra tacle la FIFA". Le Figaro. 14 Feb 2015. ^ "Celtic deny reports of Lassana Diarra deal". The Scotsman. 3 November 2014. Retrieved 3 November 2014. ^ "Lassana Diarra ordered to pay €10 million to Lokomotiv Moscow". www.goal.com. 28 May 2016. ^ "Former Chelsea, Real Madrid player Lassana Diarra signs with Marseille". ESPNFC. 24 July 2015. Retrieved 24 July 2015. ^ "Lassana Diarra Olympian". Olympique de Marseille. 24 July 2015. ^ "Ligue 1 Team of the Year 2016- UNFP Team of the Season 2015/16". French Football Daily. 8 May 2016. ^ "Lassana Diarra named OM captain". Olympique de Marseille (in French). 11 August 2016. Retrieved 11 August 2016. ^ "Bafétimbi Gomis awarded the Marseille captaincy". Get Football News France. 20 November 2016. Retrieved 25 November 2016. ^ "Lassana Diarra becomes free agent after Marseille contract terminated". ESPN. 14 February 2017. Retrieved 27 February 2017. ^ "لاسانا ديارا إلى الجزيرة الإماراتي" (in Arabic). ^ "Lassana Diarra becomes free agent after Al Jazira contract terminated". ESPN. 24 December 2017. ^ "Lassana Diarra au Paris Saint-Germain". psg.fr. 23 January 2018. ^ a b "Lassana Diarra makes debut - PSG.fr". en.psg.fr. Retrieved 2018-01-31. ^ "Lassana Diarra a résilié son contrat avec Paris". Retrieved 19 February 2019. ^ "Paris St-Germain: Lassana Diarra contract terminated". 21 February 2019 – via www.bbc.co.uk. ^ "Lassana Diarra Announces Retirement From Football After Being Released by Paris Saint-Germain". 90 Min. 21 February 2019. Retrieved 1 April 2019. ^ "Ambrose strike saves England". UEFA. 11 November 2005. Retrieved 5 February 2014. ^ "England undone by brave Briand". UEFA. 15 December 2005. Retrieved 5 February 2014. ^ "Anelka to the rescue for France". UEFA. 24 March 2007. Retrieved 5 February 2014. ^ Whyatt, Chris (9 June 2008). "Romania 0–0 France Match Report". BBC. Retrieved 21 June 2008. ^ McNulty, Phil (13 June 2008). "Netherlands 4–1 France Match Report". BBC. Retrieved 21 June 2008. ^ McNulty, Phil (17 June 2008). "France 0–2 Italy & Netherlands 2–0 Romania Match Reports". BBC. Retrieved 21 June 2008. ^ "Les Blues omit Nasri". Sky Sports. 12 August 2008. Retrieved 12 August 2008. ^ a b "Lassana". Fff.fr. 29 January 2009. Retrieved 5 February 2014. ^ "Lassana Diarra forfait". Algerie. 22 May 2010. Archived from the original on 3 March 2016. Retrieved 5 February 2014. ^ Pugmire, Jerome (23 May 2010). "Diarra resting after missing out on World Cup". USA Today. Retrieved 24 May 2010. ^ "Lassana Diarra returns to France fold after five-year absence". Mail Online. Retrieved 2015-10-07. ^ "N'Golo Kante in France's Euros squad; Lacazette, Gameiro, Ben Arfa miss out". ESPN. 12 May 2016. ^ "Euro 2016: Lassana Diarra ruled out, Morgan Schneiderlin comes in". BBC. 31 May 2016. ^ a b Julien Laurens (1 December 2015). "Lassana Diarra leads five outstanding performers of the Ligue 1 season so far". ESPN FC. Retrieved 1 March 2017. ^ "Real Madrid C.F. – Official Web Site – A pleasant surprise". Realmadrid.com. 4 June 2009. Archived from the original on 31 December 2010. Retrieved 28 April 2011. ^ "Lassana Diarra: Talentspotter". FourFourTwo. 1 February 2006. Retrieved 1 March 2017. ^ Henry Winter (2 November 2008). "Hard-working Bolton Wanderers reap the rewards against Manchester City". The Telegraph. Retrieved 1 March 2017. ^ Michael E. Miller (16 November 2015). "Lassana Diarra: The heartbreaking story of the France international defying Isis". The Independent. Retrieved 1 March 2017. ^ a b "Arsenal take Diarra from Chelsea". BBC Sport. 31 August 2007. Retrieved 1 March 2017. ^ Ian Hawkey (15 November 2015). "England vs France: Lassana Diarra back at Wembley after comeback tainted by tragedy during Paris terrorist attacks". The Telegraph. Retrieved 1 March 2017. ^ Editorial (24 November 2009). "El Clasico Inquisition: Real Madrid & Barcelona's Unsung Heroes". Goal.com. Retrieved 28 April 2011. ^ "Lassana Diarra". HITC.com. Retrieved 1 March 2017. ^ Fulco, Hugo (14 November 2015). "Cousin of ex-Chelsea, Arsenal, Real Madrid star & international midfielder killed in Paris attacks". CaughtOffside. Retrieved 14 November 2015. ^ a b c d "L. Diarra". Soccerway. Retrieved 3 November 2014. ^ Expression error: Unexpected < operator%5b%5bCategory:ParserFunction errors%5d%5d "Games played by Lassana Diarra in /1" Check |url= value (help). Soccerbase. Centurycomm. Retrieved 3 November 2014. ^ "FA Cup final - Chelsea 1-0 Man Utd". BBC Sport. 19 May 2007. Retrieved 3 November 2014. ^ "PSG clinch Ligue 1 title by thrashing Monaco". ^ "MBAPPÉ STARS AS PSG BEAT MONACO TO LIFT CUP". Ligue 1. Retrieved 1 April 2018. ^ "PSG thrash Monaco to win French Super Cup as Neymar plays 15 minutes". ESPN. Retrieved 4 August 2018. Wikimedia Commons has media related to Lassana Diarra.